As Blackburn’s manager Steve Kean prepares to leave for India on Tuesday evening for talks with the club’s owners on Wednesday, a critical difference of opinion over his fate persists; on one side are senior club officials at Ewood Park and at Venky’s HQ in Pune, and on the other side is the Rao family matriarch, Anuradha Desai. The majority are believed to want change in the manager’s position, as they have since early in the 2011-12 season, while Mrs Desai has steadfastly stood by a man she described as ‘unsackable’ when initially giving him the job on a permanent basis in January 2011. The next 48 hours will be pivotal for the future of the club, just relegated from the Premier League. With Venky’s coming under increasing media scrutiny in India for the Ewood debacle, it is thought there remains an outside chance that Mrs Desai might still reconsider her position on Kean. A ‘Kean Out’ petition, signed by more than 5,000 fans in the past few days, will also help to focus Mrs Desai’s mind when delivered today, although she has remained impervious to widespread supporter concerns for months. Kean himself remains convinced he will be Blackburn’s manager as they enter the Championship. He has declined to comment on reports that he will go to India and recommend that Blackburn’s press officer Paul Agnew – a key ally of his at Ewood – should become the club’s CEO. Sportingintelligence has learned that Mrs Desai has been considering other options for the main executive post but has yet to take a final decision. As we reported last week, Blackburn’s former CEO Paul Hunt wrote to Mrs Desai in December, urging that Kean be replaced in an attempt to save the season. Hunt was sacked the night that story appeared despite the fact he did not leak that letter to Sportingintelligence. Hunt was not alone within Rovers and Venky’s in believing that Kean should have been replaced much earlier in 2011-12. Suggestions of a one-man plot by Hunt against Kean are ill-informed. In fact it is understood that Mrs Desai was also urged by Blackburn’s director of football, Simon Hunt (no relation to Paul) as well her most senior Indian executive at Ewood, Vineeth Rao, to replace Kean with a more experienced manager many months ago. Even Mrs Desai’s brothers, Balaji and Venky, have privately advocated change during the season just finished, as have other Venky’s officials, all to no avail. So far. The split remains ongoing, with some senior people within Venky’s talking privately of alternative managerial options: Blackpool’s Ian Holloway is among them. The most obvious problem for Mrs Desai in replacing Kean is finding a replacement who will be as vocally supportive as Kean despite working conditions many managers would find intolerable – like marginal input in many transfers. Venky’s continue to remain mostly immune to any bad publicity but are aware that at some stage it could start to have a materially damaging impact on their businesses. 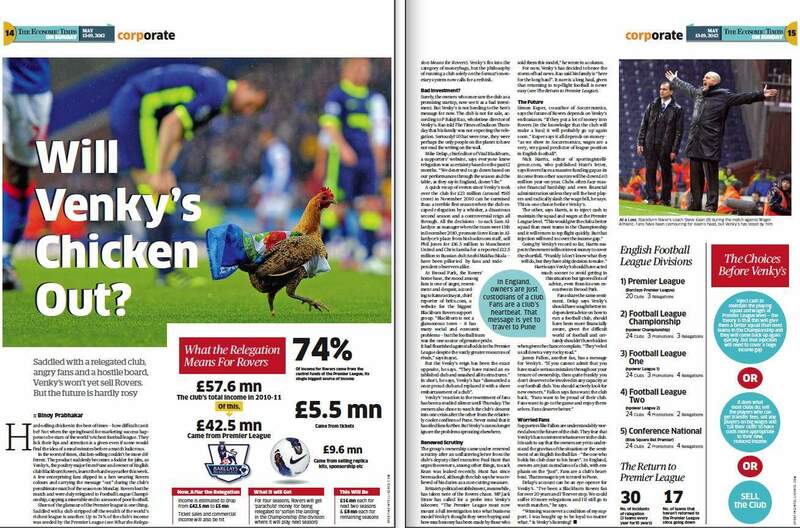 Among the weekend’s coverage of Blackburn in India was a feature in the Economic Times of India, posing the question ‘Will Venky’s Chicken Out?’. A link to that piece is here, while the pages as they appeared in print are below (click to enlarge). Other print, radio and TV media in India are looking at the story. Both Balaji and Venky Rao gave interviews last week saying the family has no intention of selling the club. Balaji added that significant changes are coming. Debate continues in Pune over how significant, and in which roles. One source in Pune says Mrs Desai would not be meeting Kean face to face if she intended to sack him.